Switzerland's Roche said Thursday it has agreed to buy all the remaining shares in Genentech for $46.8 billion in a takeover described as the largest in Swiss corporate history. The deal, approved and recommended by Genentech's board, offers $95 for each outstanding Genentech Inc. share and ends a long corporate struggle between the Basel, Switzerland-based pharmaceutical giant and its cancer-drug partner. Roche Holding AG, which already owns 56 percent of the stock of the South San Francisco-based company, had increased its bid to $93 per share last Friday. 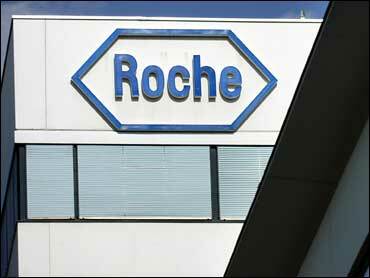 Roche's initial bid of $89 per share was rejected in July. It then surprised Genentech and Wall Street with a lowered $86.50-per-share bid on Jan. 30, aimed directly at shareholders and seeking to bypass Genentech's board. Hanging over the negotiations have been expectations of study data on the effectiveness of Genentech's Avastin in treating early-stage colon cancer. The drug, Genentech's best-selling product, is already approved for various types of breast, lung and colon cancers. Some analysts said a positive study could increase the value of Genentech shares. A joint statement by both companies said, "Roche and Genentech announced today that they signed a merger agreement under which Roche will acquire the outstanding publicly held interest in Genentech for $95 per share in cash." It said the special committee of Genentech's board of directors had approved the agreement and recommends that Genentech shareholders tender their shares in Roche's offer. "We believe this is a fair offer for Genentech shareholders, and the committee is pleased to come to a successful conclusion of this process," said Charles Sanders, chairman of the special committee of Genentech's Board of Directors. "We look forward to working with Roche to complete the transaction as expeditiously as possible." Franz B. Humer, chairman of Roche, said he was pleased that the two sides could agree. "Working together, we aim to close the transaction quickly, thus removing uncertainty for employees and allowing us to focus even more intently on innovation and long-term projects. We have tremendous respect for our colleagues at Genentech and look forward to working with them to further accelerate our search for solutions to unmet medical needs." Roche said the combined company would be the seventh-largest U.S. pharmaceutical company in terms of market share and would generate about $17 billion in annual revenues with a payroll of around 17,500 employees in the U.S. pharmaceuticals business alone. Roche said its Pharma commercial operations in the U.S. will be moved from Nutley, New Jersey, to Genentech's site in South San Francisco, which will become headquarters of the combined company's U.S. commercial operations in pharmaceuticals and operate under the Genentech name. It said this would take advantage of "the strong brand value of Genentech in the U.S. market." The size of the Roche-Genentech deal eclipses the $39 billion takeover of U.S. eye care company Alcon announced last April by Roche's Swiss rival Novartis AG.